Rentschler Biopharma is a solid, family owned, medium-sized company in its fifth family generation. We have preserved our independence since the company's formation in 1927. We are active worldwide and, thanks to our long-standing experience, the high quality of our associated consulting activities, and our outstanding expertise in finding solutions, we are among the best in the industry. Come aboard! We invite you to come grow with us. Rentschler Biopharma offers diverse fields of activity in an innovative, future-proof industry. Our corporate culture is characterized by mutual trust, respect and an open communicative nature. What unites us at Rentschler Biopharma, is the passion for what we do. As a new employee, you will receive professional coaching and training from a mentor. Flat hierarchies, short decision-making processes and a cooperative climate ensure that you will quickly feel at home. In addition to competitive, performance-based remuneration, at Rentschler Biopharma we offer you numerous first-class social security benefits. These include an employer-funded company pension plan, an employee-funded old-age pension plan (deferred compensation), a Christmas bonus, vacation pay as well as contributions to capital formation. We help employees who find themselves in emergency situations through our benevolent fund. Our in-house cafeteria provides nutritious meals at lunch time. The knowledge and skills of our employees are the foundation of our company’s success. That is why we offer both young people starting their career as well as our long-time employees and managers target-group-oriented further and continuing education opportunities, which will help you grow both professionally as well as personally. The education offerings are, among other things, in the area of professional expertise, methodological expertise, interpersonal skills or languages. You will receive valuable feedback and new objectives for your personal development in an annual performance review with your leader. Thanks to flexible working hours and individual arrangements, Rentschler Biopharma makes it easy for you to balance family and career. Your children are always in the best of hands in our in-house, well-appointed daycare center, situated directly on company premises. Our company is located in Laupheim, on the edge of Baden-Württemberg on the Bavarian border. Ulm is the closest large city, 20 kilometers away. Commuting to work is possible either by car or with the regional train. The metropolises of Stuttgart and Munich can be reached in about 90 minutes on the freeway. A large assortment of varied leisure activities ensures a healthy work-life balance. The numerous forests and Danube wetlands in the immediate vicinity provide ample room for relaxing in nature, as do the close-by Swabian Mountains, Lake of Constance and the Allgäu alpine upland. Rentschler Biopharma was awarded 2nd most attractive in "Germany's most sought-after employer" in the pharmaceutical industry in a study by the F.A.Z. Institute and the IMWF Institute for Management and Economic Research. 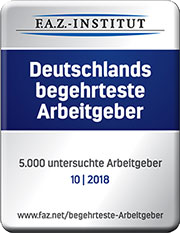 For the study, a total of 5,000 companies based in Germany were analysed between 1 January 2015 and 30 June 2018 and examined with regard to performance factors of employers, profitability, products and services, sustainability and management. The study as a whole can be found here (in German).